The Edmonton Jewish Film Festival (EJFF) is a celebration of Jewish culture, identity, religion and history, through film. Organized by the Jewish Federation of Edmonton, the EJFF is one of the largest and most visible Jewish cultural events in our city. The EJFF presents a variety of Jewish-themed dramas, comedies, mysteries and documentaries from all over the world. All are high-quality films, playing in Edmonton for the first time. Guest speakers and special events enhance the film screenings, engaging audiences and giving everyone the opportunity to learn, to question and to gain perspective on Jewish experiences. 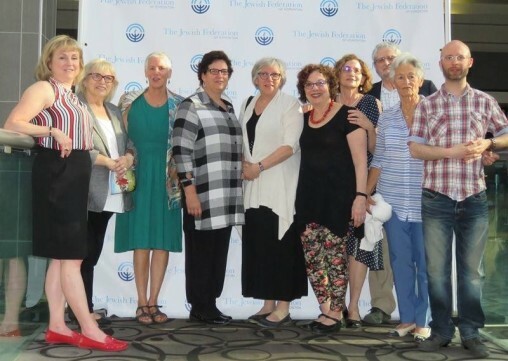 Founded in 1996, the EJFF is the result of the hard work and talent of the volunteer Edmonton Jewish Film Festival Committee, made up of film enthusiasts and experts from throughout the community. The Committee spends each winter screening dozens of films before selecting the final film line-up for the annual Festival, which takes place each May at Landmark City Centre Cinemas. The Edmonton Jewish Film Festival -- Come explore, discover, and schmooze with us!